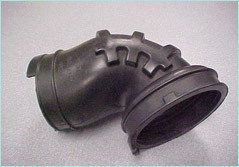 Lenard Tool & Machine, Inc. (LTM) was approached by a US-based auto industry customer to produce a mold for the Ethylene Acrylate (AEM) Intake Elbow highlighted here. 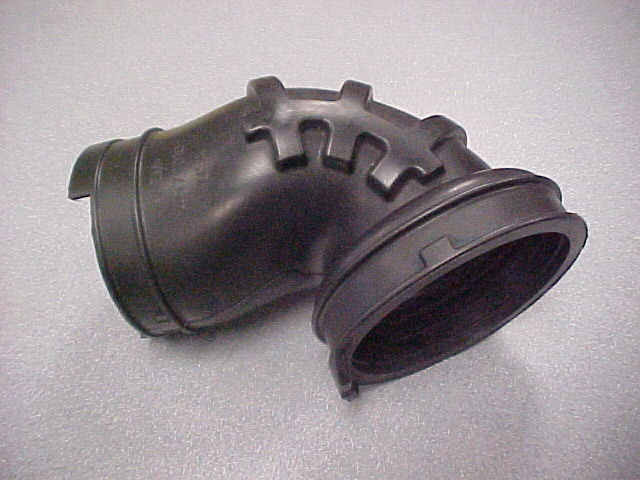 LTM's development of the mold design would have to accurately reproduce the nuanced geometry of the elbow while still providing a high-performance and cost-effective solution. Design of the mold commenced on CAD/CAM software, integrating the requirements of the customer and the complex geometry of the elbow. LTM specified a mold layout incorporating cooled runners and drops, along with heated cavity plates and cores. This setup allowed for an efficient balance between cost and injection cycle time. LTM's design also incorporated its own press mounted rail system for core bar installation, which doubles production rates by employing paired sets of cores. Pre-hardened 420 stainless steel was selected as the material for the cavity plates, and 1144 steel for the cores. Fabrication utilized CNC milling and turning as the primary manufacture processes, along with electron discharge machining (EDM), surface grinding, bead blasting, and gun drilling. Wall thickness was set at 0.2" and tolerances were kept at ±0.001." A complete validation of mold geometry and functionality was done to guarantee performance in the completed mold. LTM's expertise in mold design and manufacture provides a critical advantage in the context of injection molded production. With an impressive turnaround time of only 12 weeks, a comprehensive, high performance solution was delivered to the customer featured here. Although only one example, LTM has rendered many similar experiences to its customers, combining efficient, experienced-driven design with their needs to create high-performance, cost effective molding solutions. Contact LTM today to learn how you can take advantage of these features and more. Development of a cold runner, cold drop injection mold with rotating core bars to mold an AEM Intake Elbow for the automotive industry. Uses Lenard Tool's press mounted rail system for rolling core bars out of press, rotating 180 degrees, and rolling back in. Cooled runner plate, cooled drops, heated cavity plates, and heated cores.